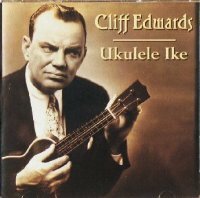 This 1996 reissue from Sony is probably the best representative sampling to date of Cliff Edwards songs on CD. Though the 28-minute length of this CD is short, it is budget-priced under $10 and that's a lot of bang for the buck! I believe Sony could have used a better cover photo - what a menacing look! This web site is free to anyone who wants to view it from the internet. As you may know it is very time-consuming and somewhat costly to put one of these biographies together. To keep the preservation of the Jazz Age’s popular music and research that you see here going, please consider a donation. All donations will go toward the funding of this research which includes travel expenses, materials, research fees, etc. Thank you for your support in preserving a piece of the World’s musical heritage. Copyright © 2007-2019 by David Garrick ("Site Owner""). All rights reserved. All original text, images, video and sound files (collectively, "Materials") are the property of the Site Owner unless otherwise noted. None of the Materials may be copied, reproduced, distributed, republished, downloaded, displayed, posted or transmitted in any form or by any means including, but not limited to, electronic, mechanical, photocopying, recording or otherwise, without the prior written consent of the Site Owner.